Just because summer is coming to a close doesn’t mean that your camping trips are over. There is still a ton of fun to be had this year. It might a little chillier than it is during the heat of the summer, but camping trips in the fall can be great. Some people like camping in the fall more than in the summer because it saves them from excruciating heat. Campfire games are a lot of fun to play while everyone is enjoying each other’s company. It also makes for some good times and some good laughs. 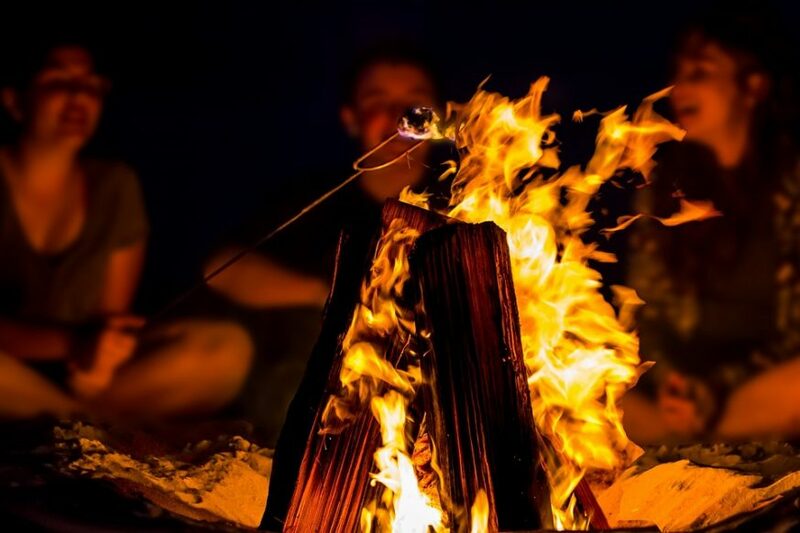 Here are some fun campfire games to play on your next camping trip. This is a fun way to get to know everyone that’s on the camping trip with you. It also has a fun way of bonding everyone because some secrets will be revealed. Someone in the group has to be “it” and think of something they’ve never done. Then they state “Never have I ever….” then something they’ve never done. Everyone that has not done that thing stays seated. Everyone that has done that thing has to run and trade places with someone else that has gotten up. This game always makes people laugh because it can get really silly. Everyone will be surprised at what some people have or have not done. This is a common car game but it also makes a great campfire game. Someone in the group needs to think of a person, place, or thing. It can be anything! Someone famous, a TV show, or a vacation spot. Then everyone has to ask questions to try to guess what the person is thinking of. The questions have to be yes or no questions, and the group only has twenty questions before they have to make a guess of what they think it is. It’s a fun way to pass time and is great to play along a difficult hiking trail to get everyone’s minds thinking of something else. Two truths and a lie is exactly what it sounds like. Everyone gets a turn to go. Each person has to think of two truths about themselves, and one lie. The more creative you get with your personal facts, the more fun it is. Don’t think of lame facts like “My birthday is in October.” That’s boring and doesn’t really make the game fun. Think of things that no one knows. Say things like, “I can put both feet behind my head” or “I know every single word to the movie Die Hard.” Of course, two things you state have to be true so don’t go making up things that you really can’t do. Everyone has to try to guess the one lie that you told, and if they get it wrong you win! The group wins if they can guess the lie correctly. Signs is a fun and fast paced game. Each person needs to think of a sign that’s just theirs. Go around the circle and everyone has to show everyone else what their unique sign will be. It could be a wink, sticking out your tongue, a thumbs up, or a monkey face. Then someone goes into the middle and is “it.” The person in the middle closes their eyes and everyone must silently decide who will start out with the sign. This can be done by simply pointing at the person that will start with the sign. The person in the middle can then open their eyes. The sign must be passed around the circle silently without the person in the middle catching you. Do a thumbs up to pass the sign to the person whose sign that is. Then they must accept the sign by doing a thumbs up back. That person now has the sign. Now they may do someone else’s sign to pass it along. The sign is not passed until the person accepts it, or does their own sign back to the person passing it. Once you accept it, you pass it along. The person in the middle tries to catch people passing the sign, and once they do the person that got caught is in the middle. Don’t worry, this game isn’t dangerous. It’s just a little yucky sometimes! You’ll need a big jar of jelly belly beans to play this game. Get a big box that includes all the delicious and disgusting flavors. There should be great flavors like lime, cherry, and peach. But there are also flavors like booger, ear wax, and vomit. Everyone has to take turns trying a jelly bean without looking at the color. Then they must try to guess the flavor of the jelly bean. It’s fun to watch people be totally relieved when they get a cherry, then watch someone be completely disgusted as they chew a dog food flavored jelly bean. There is one goal to this game; don’t laugh. Someone has to be in the hot seat to play, and this person cannot laugh. Everyone in the entire group tries to make the one person laugh. They can try anything to make the person laugh. It’s better to have some rules instead of a total free for all. There’s no touching the person in the seat, and there can’t be any mean comments made. The person in the hot seat has to try to last 2 minutes without laughing. Their teeth cannot show or they’re out! It’s incredible to see what lengths people will go through to make someone else laugh. People can get pretty creative! Storytelling is always great to do around a campfire. However, this article is about campfire games so it’s got to be a game! Have someone start the story by starting a sentence. It could be anything. They could say, “There once was a dog named Julio…” then the next person must finish the sentence and start another. It goes around the circle as everyone adds to the story. It gets really funny as you start to see everyone’s creativity. Everyone will laugh as they see what happens to the dog named Julio and how the story makes funny and random turns. 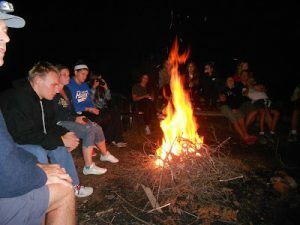 Campfire games are a great way to let everyone have a memorable and fun camping trip. They have a way of breaking the ice and helping everyone to get to know each other a little more. There are so many fun memories to be had with campfire games. 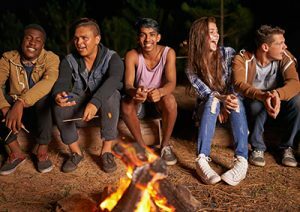 You’ll love being able to have such a great time with your friends and family with these fun campfire games.